Two men from opposite ends of the world come together to celebrate their passion for music. These true masters of their instruments create a musical experience that goes well beyond any musical genre. Their music, together with their lighthearted banter, is always met with enthusiastic audience response. 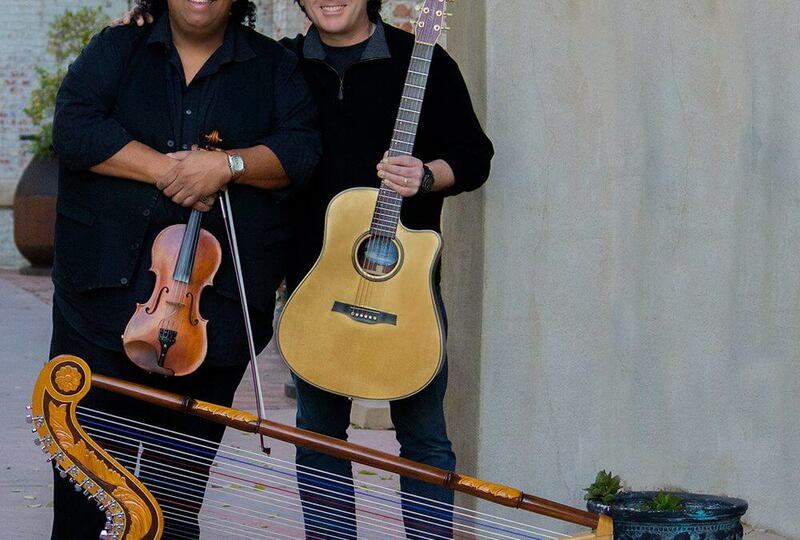 Take a journey with these two global musicians, and enjoy a performance that is truly unforgettable! A native of Italy, D’Agostino has made his considerable international mark as a musical artist on the guitar since he arrived in America over 30 years ago. In 2017 Guitar Player magazine listed him as one of the 50 transcendent superheroes of the acoustic guitar. The CD Every Step of The Way was awarded by Acoustic Guitars Peoples’ Choice Awards with a Bronze medal for Best Acoustic Album of All Time. His signature Seagull acoustic guitar has been voted among the ten best signature guitars by Guitar Player magazine. Peppino gives guitar workshops, master classes and seminars worldwide. Top leading publishers such as Truefire, Alfred Publishing, Hal Leonard and Acoustic Guitar Magazine Books have published his compositions and instructional methods. Carlos Reyes – recording artist, producer, engineer, harpist and violinist – has been breaking musical barriers since his first public performance at the age of five. Born in Paraguay, South America, he began his musical education at the age of three and a half on the violin. A few years later, his father, a musical and national hero in Paraguay, dared young Carlos to learn the complicated 36 string native Paraguayan harp. Taking his father’s challenge seriously; Carlos purchased his first harp for $50.00 when he was just ten years old. Two weeks later, he earned a double encore and $250.00 at his first professional harp concert. Since then he has taken the Harp and its music to new and ground breaking levels. At an early age Carlos eventually learned to play many different instruments including Guitar, Bass, Mandolin, Keyboards, as well as mastering the use of a variety of electronic devices and special effects. Carlos’ first album, The Beauty of it All, was on the Top-Ten Contemporary Jazz charts in Billboard Magazine for over 15 weeks. Over the years he has backed such artists as Chuck Mangione, Bill Evans, Clark Terry, Pat Travers, and MC Hammer. He has shared the concert stage with great artists from Craig Chaquico, The Crusaders, The Rippingtons, and Roy Rogers to Charlie Daniels, Wynona Judd, Clint Black, Willie Nelson, John Handy, The Doobie Brothers, Steve Miller, and many more.